I am from Egypt, the land of delicious cotton. In fact, I and the cotton have lived here in Egypt for thousands of years. Even back in the ancient Egypt we were both famous. Cotton has been spun, woven and dyed in Egypt since prehistoric times. Storks are widely known as dedicated parents. Our care for the young in easily visible nests makes us a widespread emblem for parental care. Since ancient Egypt it is widely noticed that a stork pair will die in the nest in a fire rather than fly and abandon their children. Yes, of course you know. I, Stork, am so highly identified with care for the infants; in fact we are identified with childbirth. As you know, around the world people hire us for safe delivery of newborn babies. I think you all have seen the image of me, the Stork, bearing an infant wrapped in cloths held in its beak. Well, I think now you understand why I, Stork, am the one and the best to provide you with the very best yarn in the world suited for lovely clothes in cotton for dolls. For thousands of years, since ancient Egypt, people have used this as an ideal material for spinning into a fine yarn. You see, it is so delicious and light. 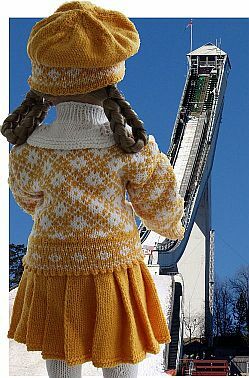 50 g, one ball of wool may contain only 60 meters or 65 yards. One ball of Stork yarn by Dale of Norway made of 100% Egyptian cotton contains 180 meter or 195 yards. Can you believe it? Fantastic? Yes, cotton is a fantastic, soft and staple fiber that grows on the cotton plant. Around the world cotton is spun and used to make delicious, soft and breathable yarn. Egyptian fiber is now considered the king of all cottons for its durability and luxurious feel. Did you ever experienced a bed with right sheets made from the king of cotton; Egyptian cotton fibers so comfortable and cozy? Yes? 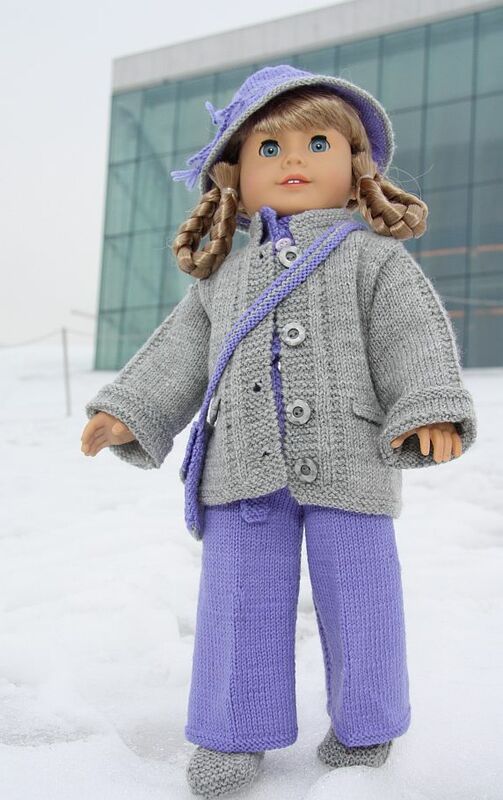 For now you know how it will be for your lovely doll to get dressed in a doll suite designed by Målfrid Gausel, knitted in yarn from the king of cotton; 100% Egyptian cotton, Stork. 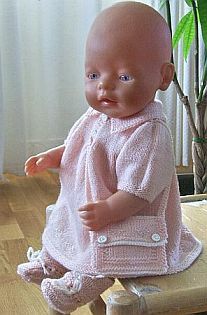 Stork by Dale of Norway is eminently suitable for ligth spring and summer doll garments. Stork yarn is a very soft and comfortable yarn made from 100% Egyptian cotton. The yarn is machine washable, fabric softener is recommended.